Presidency confirms no Wednesday FEC meeting, confirms budget signing – Royal Times of Nigeria. 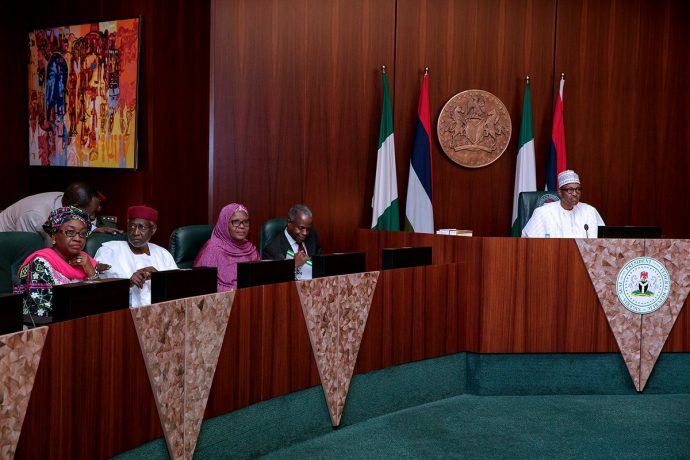 The Presidency on Tuesday confirmed that the weekly meeting of the Federal Executive Council will not hold this week. The Special Adviser to the President on Media and Publicity, Femi Adesina, in a statement made available to journalists also confirmed that President Muhammadu Buhari will on Wednesday sign the 2018 Appropriation Bill. Adesina attributed the cancellation of the meeting to the recent public holidays declared by the Federal Government to mark the Eid-el-Fitr. He explained that the holidays affected the preparation of memoranda for the meeting. The statement read, “President Muhammadu Buhari will sign the 2018 Appropriation Bill into law Wednesday at noon (12pm). “Meanwhile, the Federal Executive Council meeting will not hold tomorrow, Wednesday, June 20, 2018. The Senior Special Assistant to the President on Media and Publicity, Garba Shehu, had on Monday confirmed to our correspondent that the document will be signed on Wednesday. “I can confirm to you that the President will sign the budget into law at midday on Wednesday,” the presidential spokesman had said. The Presidency had said Buhari will only take a stand on the document based on the advice he was expecting from the Minister of Budget and National Planning, Udo Udoma. It said all ministers were expected to scrutinise the budget passed against the proposals they submitted and report their findings to Udoma.